Investigating 9/11 and Other Acts of the Secret State. was valid? What was a guess? We just didn't know." Although it has been widely reported that four commercial aircraft were hijacked over the United States on September 11, 2001, what is less well known is that while the terrorist attacks were taking place and for many hours after, numerous additional aircraft gave indications that they had been hijacked or, for other reasons, were singled out as potential emergencies. More than 20 aircraft were identified as possible hijackings, according to some accounts, and other aircraft displayed signs of emergencies, such as losing radio communication with air traffic controllers or transmitting a distress signal. There may be innocent explanations for some of the less serious false alarms, such as those simply involving the temporary loss of radio communication with the plane, which is a common occurrence and happens on a daily basis. But, viewed in its entirety, the evidence appears highly suspicious and raises serious questions. Why, for example, were there so many false alarms on September 11? Why did so many of them involve false reports of hijackings or aircraft falsely signaling that they had been hijacked? The details of specific incidents that have been reported, which I describe below, show that these false alarms must have been something more than just the results of confusion caused by the terrorist attacks. The possibility that these false alarms were deliberate and intended to fulfill a sinister purpose needs to be seriously examined. Were they coordinated and pre-planned by rogue insiders working in the military and other U.S. government agencies, so as to ensure the attacks succeeded? By tying up personnel, the false alarms could also have prevented anyone from making public information that contradicted the official 9/11 story that was being put out, and that would raise questions about who was actually responsible for the attacks. By the time a person with such information was free to reveal it, after the crisis calmed down, the official story would already have been extensively promoted to the public and generally accepted as true, and so it would be too late to effectively disclose information that would cast serious doubt on that account. I describe below details of some of the flights that were among the false alarms on September 11. Firstly, I examine nine flights that were mistakenly considered to have been hijacked. I then examine flights for which we either do not know the nature of the false alarm, due to the lack of available information (so the aircraft may have been a suspected hijacking, but this fact has not been reported), or the emergency is known to have been something other than a suspected hijacking, such as a loss of radio contact with the aircraft. Another early false report of a hijacking occurred at 9:25 a.m., when Marcus Arroyo, the security division manager for the FAA's eastern region, called Mark Randol, the manager of the FAA's Washington, DC, Civil Aviation Security Field Office, and alerted him to several hijackings. Arroyo mentioned Flight 175 and Flight 77 (the second and third aircraft actually targeted that morning), but also said, incorrectly, that another aircraft, United Airlines Flight 177, had been hijacked. Randol's staff soon discovered that Flight 177 was still on the ground at Logan International Airport in Boston, being held at the gate there. No explanation has been given for why Flight 177 was falsely reported as a hijacking. One of the aircraft mistakenly suspected of being hijacked on September 11 about which most has been reported is Korean Airlines Flight 85. This plane gave several indications that it had been hijacked, was tailed by fighter jets, and was even threatened with being shot down by the military. As previously mentioned, there were some false alarms on September 11 for which the specific nature of the emergency is unstated. These may have been suspected hijackings or they may have been something else, like the loss of radio contact or the loss of a transponder signal. An example of this is an incident that occurred shortly after 11:00 a.m., when three suspicious flights were reported as approaching the U.S.
At 11:18 a.m., it was reported on an FAA teleconference that the Coast Guard in Norfolk, Virginia, had received distress signals from Air Canada Flight 65, Continental Airlines Flight 57, and United Airlines Flight 947. Whether these distress signals were the "7500" transponder code signaling a hijacking, or something else, is unreported. The three aircraft were reported as being over the Atlantic Ocean. Jeff Griffith, the deputy director of air traffic at FAA headquarters, subsequently instructed John White at the FAA's Command Center to alert NORAD to the aircraft, and to also notify the Air Traffic Services Cell (ATSC), an office at the Command Center manned by military reservists. - American Airlines Flight 2247: At 10:04 a.m., the FAA's Fort Worth Center reported this flight to the Command Center. The aircraft, going from Orlando, Florida, to Shreveport, Louisiana, was "NORDO," meaning radio contact with it had been lost. Communication was restored by 10:17 a.m.
- U.S. Airways Flight 41: The FAA's Memphis Center reported this plane, going from Charlotte, North Carolina, to Los Angeles, to the Command Center. The reason for the report is unknown. - Northwest Airlines Flight 197: The Command Center appears to have been alerted to this plane, en route from Lansing, Michigan, to Minneapolis, Minnesota, at 10:03 a.m. The reason for the report is unknown. Flight 197 subsequently landed in Marquette, Michigan. - United Airlines Flight 641: United Airlines lost contact with this plane at around 10:00 a.m., but persistent attempts to communicate with it were eventually successful. The flight subsequently landed in Detroit, Michigan. - United Airlines Flight 57: This aircraft was reported as missing sometime between 10:55 a.m. and 11:15 a.m. It appears to have been reported to the Command Center by controllers at Denver International Airport, for reasons that are unknown. It subsequently landed in Garden City, Kansas. At around 11:16 a.m. (U.S. Eastern time), a United Airlines aircraft maintenance officer at a facility in London, England, received a brief but suspicious phone call from an unidentified aircraft, in which the caller--apparently the plane's pilot--sounded distraught, possibly as if he was being choked. The maintenance officer recognized the call as coming from a particular type of satellite phone that is available on Boeing 767s and 777s, although he believed it was most likely from a 777. He told the 9/11 Commission that the caller sounded strange, and that this was the "only phone call that he'd ever received of that nature in the 10 years he's been on the job for United." As previously mentioned, the temporary loss of radio contact with aircraft is a common occurrence. And an order issued by the FAA at 9:45 a.m., for all aircraft over the U.S. to land at the nearest airport, presumably complicated interactions between pilots and air traffic controllers. But can these factors account for a single airline losing communication with so many of its planes, all on the same day, and all within such short spaces of time? And on September 11, 2001, of all days, when two of the aircraft targeted in the terrorist attacks belonged to that particular airline? It seems reasonable to assume there were other false alarms that have not yet come to light. If Larry Arnold's claim of "21 aircraft identified as possible hijackings" or Robert Marr's claim of "29 different reports of hijackings" are anywhere near accurate, then there must have been additional false reports of hijackings beyond what I have described. Who or what caused these false alarms? What effect did they have on the ability of the military and other U.S. government agencies to respond to the actual attacks, and to then assess how those attacks had been able to succeed? These questions have not yet been adequately addressed, and need to be investigated thoroughly. Lynn Spencer, Touching History: The Untold Story of the Drama That Unfolded in the Skies Over America on 9/11. New York: Free Press, 2008, p. 196. Draft: The Air Traffic Organization's Response to the September 11th Terrorist Attack: ATC System Assessment, Shutdown, and Restoration. Federal Aviation Administration, March 21, 2002, p. S-26; "Full Transcription; Air Traffic Control System Command Center, National Traffic Management Officer, East Position; September 11, 2001." Federal Aviation Administration, October 21, 2003. See Donald A. Robinson Jr., interview by the FBI. Federal Bureau of Investigation, September 11, 2001; "Memorandum for the Record: Staff Visit to the Boston Center, New England Region, FAA." 9/11 Commission, September 22-24, 2003. "September 11, 2001." New Yorker, September 24, 2001. "NORAD Exercises: Hijack Summary." 9/11 Commission, n.d.
 Leslie Filson, Air War Over America: Sept. 11 Alters Face of Air Defense Mission. Tyndall Air Force Base, FL: 1st Air Force, 2003, p. 73. "Memorandum for the Record: Interview With Jane Garvey." 9/11 Commission, October 21, 2003; Lynn Spencer, Touching History, p. 186. Lynn Spencer, Touching History, pp. 125-126. Pamela Freni, Ground Stop: An Inside Look at the Federal Aviation Administration on September 11, 2001. Lincoln, NE: iUniverse, Inc., 2003, p. 65. 9/11 Commission, The 9/11 Commission Report: Final Report of the National Commission on Terrorist Attacks Upon the United States. New York: W. W. Norton & Company, 2004, p. 28. "Chilling Audio From 9/11 Hijack Played at Hearing." Paula Zahn Now, CNN, June 17, 2004. "Conversation With Major General Larry Arnold, Commander, 1st Air Force, Tyndall AFB, Florida." Code One, January 2002. Robert A. Baker, "Commander of 9/11 Air Defenses Retires." Newhouse News Service, March 31, 2005. 9/11 Commission, The 9/11 Commission Report, pp. 26, 28. Ibid. p. 26; Michael Bronner, "9/11 Live." "Memorandum for the Record: Interview With Mark Randol, Former Manager of the Civil Aviation Security Field Office in Washington, DC." 9/11 Commission, October 8, 2003. Marilyn Adams, Alan Levin, and Blake Morrison, "Part II: No One Was Sure if Hijackers Were on Board." USA Today, August 12, 2002; "Memorandum for the Record: Interview With John Werth, Air Traffic Controller, Area 4, Lorain Sector." 9/11 Commission, October 1, 2003; "Memorandum for the Record: Interview With Kim Wernica, Operations Manager at Cleveland ARTCC on 9/11." 9/11 Commission, October 2, 2003. Michael Bronner, "9/11 Live"; Untitled Chronology of FAA and NEADS Communications on September 11, 2001. 9/11 Commission, n.d.
 Marilyn Adams, Alan Levin, and Blake Morrison, "Part II: No One Was Sure if Hijackers Were on Board"; Alan Levin, "For Air Controller, Terror Still Vivid 7 Years Later." USA Today, September 11, 2008. Marilyn Adams, Alan Levin, and Blake Morrison, "Part II: No One Was Sure if Hijackers Were on Board"; 9/11 Commission, The 9/11 Commission Report, pp. 27-28. Marilyn Adams, Alan Levin, and Blake Morrison, "Part II: No One Was Sure if Hijackers Were on Board"; Lynn Spencer, Touching History, pp. 167-168. "DAL 1989 Order of Events." Federal Aviation Administration, September 16, 2001. Ibid. ; Marilyn Adams, Alan Levin, and Blake Morrison, "Part II: No One Was Sure if Hijackers Were on Board." Michael O'Mara, "9/11: 'Fifth Plane' Terror Alert at Cleveland Hopkins Airport." WKYC, September 11, 2006; Lynn Spencer, Touching History, p. 270. Marilyn Adams, Alan Levin, and Blake Morrison, "Part II: No One Was Sure if Hijackers Were on Board." For more information about Delta Airlines Flight 1989, see "Was Delta 1989 Part of a Live-Fly Hijacking Exercise on 9/11?" Shoestring 9/11, July 22, 2009. "Full Transcription; Air Traffic Control System Command Center, National Traffic Management Officer, East Position; September 11, 2001"; Miles Kara, "Transcript of East NTMO, Line 4530, Admin Line." 9/11 Commission, November 4, 2003. Donald A. Robinson Jr. interview by the FBI; Scott McCartney and Susan Carey, "American, United Watched and Worked in Horror as Sept. 11 Hijackings Unfolded." Wall Street Journal, October 15, 2001. For example, the Bureau of Transportation Statistics database of "Airline On-Time Data" reveals that Flight 189 was the only American Airlines plane going from Boston to Seattle that day. Donald A. Robinson Jr. interview by the FBI; Scott McCartney and Susan Carey, "American, United Watched and Worked in Horror as Sept. 11 Hijackings Unfolded." NEADS Audio File, Mission Crew Commander Position, Channel 2. North American Aerospace Defense Command, September 11, 2001. NEADS Audio File, Identification Technician Position, Channel 4. North American Aerospace Defense Command, September 11, 2001; "NEADS CDs." 9/11 Commission, n.d.
 Alan Levin, "Korean Air Jet May Have Narrowly Missed Disaster." USA Today, August 12, 2002; Zaz Hollander, "High Alert." Anchorage Daily News, September 8, 2002. Alan Levin, "Korean Air Jet May Have Narrowly Missed Disaster"; Lynn Spencer, Touching History, pp. 277-278. September 11, 2001, Whitehorse International Airport Emergency: Public Findings Report. Whitehorse, Yukon: Yukon Government, November 13, 2001, p. 17. Alan Levin, "Korean Air Jet May Have Narrowly Missed Disaster"; Lynn Spencer, Touching History, p. 278. Alan Levin, "Korean Air Jet May Have Narrowly Missed Disaster"; Zaz Hollander, "High Alert." September 11, 2001, Whitehorse International Airport Emergency, p. 18. Zaz Hollander, "False Sept. 11 Hijack Signal Put Air Force on Alert." Anchorage Daily News, September 29, 2001; September 11, 2001, Whitehorse International Airport Emergency, p. 27; Alan Levin, "Korean Air Jet May Have Narrowly Missed Disaster." Zaz Hollander, "False Sept. 11 Hijack Signal Put Air Force on Alert"; Stephanie Waddell, "9/11 Documentary to be Released Next Year." Whitehorse Daily Star, December 31, 2010. "NORAD Exercises: Hijack Summary." For more details about Korean Airlines Flight 85, see "Was Korean Airlines Flight 85 a Simulated Hijack in a 9/11 Training Exercise?" Shoestring 9/11, April 18, 2010. Rebecca Grant, The First 600 Days of Combat. Washington, DC: IRIS Press, 2004, p. 26. "Chronology of Events (All Times are Local Eastern Daylight Time)." Federal Aviation Administration, September 11, 2001; "Conversation With Major General Larry Arnold." "ADA-30 Operations Center Activity Report, September 11-14, 2001." Federal Aviation Administration, September 2001; "Chronology of Events (All Times are Local Eastern Daylight Time)"; "Eastern Region Operations Center Log: Chronological Events of Hijacking Crisis." Federal Aviation Administration, January 2, 2002. Lewis Libby, interview by Newsweek magazine. White House, November 16, 2001. "Eastern Region Operations Center Log"; Leslie Filson, Air War Over America, p. 88. Lewis Libby, interview by Newsweek magazine. Draft: The Air Traffic Organization's Response to the September 11th Terrorist Attack, pp. S-26, S-29, S-33; "Full Transcription; Air Traffic Control System Command Center, National Traffic Management Officer, East Position; September 11, 2001." Untitled Air Traffic Services Cell Chronology of Events. U.S. Air Force, September 11, 2001. David Bond, "Crisis at Herndon: 11 Airplanes Astray." Aviation Week & Space Technology, December 17, 2001. 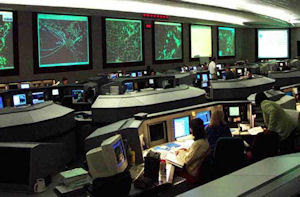 Untitled FAA Command Center Chronology of the Events of September 11, 2001. Federal Aviation Administration, September 11, 2001; "Statement of Andrew P. Studdert to the National Commission on Terrorist Attacks Upon the United States." 9/11 Commission, January 27, 2004; "Suspect Aircraft of September 11, 2001." 9/11 Commission, n.d.
 Lynn Spencer, Touching History, p. 126. Marilyn Adams, Alan Levin, and Blake Morrison, "Part II: No One Was Sure if Hijackers Were on Board." David Bond, "Crisis at Herndon." Ray Kime, interview by the FBI. Federal Bureau of Investigation, September 11, 2001; "Memorandum for the Record: Interview With Rich Belme, Manager of United Airlines SAMC in San Francisco, CA." 9/11 Commission, November 21, 2003; "Memorandum for the Record: Interview With [Name Redacted], United Airlines." 9/11 Commission, November 21, 2003. "Statement of Andrew P. Studdert to the National Commission on Terrorist Attacks Upon the United States." See Donald A. Robinson Jr., interview by the FBI; "Memorandum for the Record: Staff Visit to the Boston Center, New England Region, FAA." U.S. Congress. House. Committee on Transportation and Infrastructure, Statement of Jane F. Garvey, Administrator, Federal Aviation Administration, Before the House Subcommittee on Aviation, Committee on Transportation and Infrastructure. 107th Cong., 1st sess., September 21, 2001; 9/11 Commission, The 9/11 Commission Report, p. 29. This is a superb contribution to what is known about the military events and hijacking reports of September 11, 2001. It should be passed around and widely posted. This story is PUBLISHED at 911NewsCentral.com.